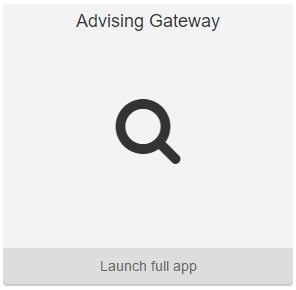 The Advising Gateway is a MyUW application that allows advisors to search for students and access a plethora of information useful to the advising process. If the app is not already on the homepage, search for "Advising Gateway" and either launch the application or Add to Home. Click on the Options link to the right side of the grey bar titled "Advising Gateway"
Open the drop-down menu on the right side of the grey bar titled "Advising Gateway"
The homepage of the Advising Gateway allows an advisor to search for students, view advisees, download an advisee email list, and access a list of recently accessed students. To get started, choose one of the available filters: "All Students", "My Advisees", or "Last Viewed". The results will display below the filters. The Search for a student field can be used to search by first and/or last name, Campus ID, or e-mail address. Note: Using the "Search for a student" field will only show results that also match the selected filter. After locating a student, click on the student's name to see more of their academic information. The student's Advising Gateway page will appear. The Alerts box in the upper right will display notable information not otherwise listed on the rest of the page. If there is more data to display, clicking one of the buttons across the middle of the page (Degree & Major, Certificates, Student group(s), and Advisor(s)) will expand the button to display the information. 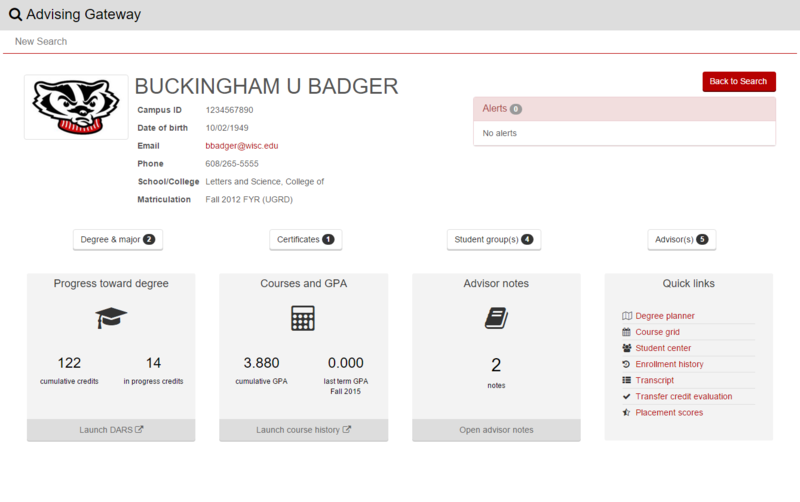 Click on Progress Towards Degree, Courses and GPA, and Quick Links to launch their corresponding external applications. 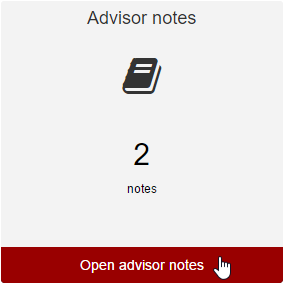 Click on Advisor Notes to view a student's Advisor Notes directly in the Advising Gateway. Note: Authorization to Advisor Notes is separate from authorization to the Advising Gateway. Users looking to be authorized for the apps should contact Jeff Shokler - jeffrey.shokler@wisc.edu. Note: Some users have reported formatting issues after pasting content from other applications (specifically Microsoft Word or Outlook) into an Advisor Note. If quotation marks aren't displaying properly, it may be necessary to disable "smart quotes" in Office. See Office 2013 - Disable Smart Quotes. Click on Advisor Notes to view a student's Advisor Notes. Click Compose Note to enter a new note for the student. Click anywhere on the line for an individual note to view its contents. In a given note you can Edit or Delete its contents. Use the arrow buttons to navigate to other notes (you can also click Back to list). Run into any issues? Contact the DoIT Help Desk for assistance.